For the episode of the television series The Americans, see Arpanet (The Americans). The Advanced Research Projects Agency Network (ARPANET) was an early packet switching network and the first network to implement the protocol suite TCP/IP. Both technologies became the technical foundation of the Internet. The ARPANET was initially funded by the Advanced Research Projects Agency (ARPA) of the United States Department of Defense. The packet switching methodology employed in the ARPANET was based on concepts and designs by Leonard Kleinrock and Paul Baran, British scientist Donald Davies, and Lawrence Roberts. The TCP/IP communications protocols were developed for the ARPANET by computer scientists Robert Kahn and Vint Cerf, and incorporated concepts from the French CYCLADES project directed by Louis Pouzin. As the project progressed, protocols for internetworking were developed by which multiple separate networks could be joined into a network of networks. Access to the ARPANET was expanded in 1981 when the National Science Foundation (NSF) funded the Computer Science Network (CSNET). In 1982, the Internet protocol suite (TCP/IP) was introduced as the standard networking protocol on the ARPANET. In the early 1980s the NSF funded the establishment for national supercomputing centers at several universities, and provided interconnectivity in 1986 with the NSFNET project, which also created network access to the supercomputer sites in the United States from research and education organizations. The ARPANET was decommissioned in 1990. Historically, voice and data communications were based on methods of circuit switching, as exemplified in the traditional telephone network, wherein each telephone call is allocated a dedicated, end to end, electronic connection between the two communicating stations. Such stations might be telephones or computers. The temporarily dedicated line typically comprises many intermediary lines which are assembled into a chain that reaches from the originating station to the destination station. With packet switching, a network could share a single communication link for communication between multiple pairs of receivers and transmitters. The earliest ideas for a computer network intended to allow general communications among computer users were formulated by computer scientist J. C. R. Licklider of Bolt, Beranek and Newman (BBN), in April 1963, in memoranda discussing the concept of the "Intergalactic Computer Network". Those ideas encompassed many of the features of the contemporary Internet. In October 1963, Licklider was appointed head of the Behavioral Sciences and Command and Control programs at the Defense Department's Advanced Research Projects Agency (ARPA). He convinced Ivan Sutherland and Bob Taylor that this network concept was very important and merited development, although Licklider left ARPA before any contracts were assigned for development. Sutherland and Taylor continued their interest in creating the network, in part, to allow ARPA-sponsored researchers at various corporate and academic locales to utilize computers provided by ARPA, and, in part, to quickly distribute new software and other computer science results. Taylor had three computer terminals in his office, each connected to separate computers, which ARPA was funding: one for the System Development Corporation (SDC) Q-32 in Santa Monica, one for Project Genie at the University of California, Berkeley, and another for Multics at the Massachusetts Institute of Technology. Taylor recalls the circumstance: "For each of these three terminals, I had three different sets of user commands. So, if I was talking online with someone at S.D.C., and I wanted to talk to someone I knew at Berkeley, or M.I.T., about this, I had to get up from the S.D.C. terminal, go over and log into the other terminal and get in touch with them. I said, "Oh Man! ", it's obvious what to do: If you have these three terminals, there ought to be one terminal that goes anywhere you want to go. That idea is the ARPANET". Meanwhile, since the early 1960s, Paul Baran at the RAND Corporation had been researching systems that could survive nuclear war and developed the idea of distributed adaptive message block switching. Donald Davies at the United Kingdom's National Physical Laboratory (NPL) independently invented the same concept in 1965. His work, presented by a colleague, initially caught the attention of ARPANET developers at a conference in Gatlinburg, Tennessee, in October 1967. He gave the first public demonstration, having coined the term packet switching, on 5 August 1968 and incorporated it into the NPL network in England. Larry Roberts at ARPA applied Davies' concepts of packet switching for the ARPANET. The NPL network followed by the ARPANET were the first two networks in the world to use packet switching, and were themselves connected together in 1973. The NPL network was using line speeds of 768 kbit/s, and the proposed line speed for the ARPANET was upgraded from 2.4 kbit/s to 50 kbit/s. Bob Taylor convinced ARPA's Director Charles M. Herzfeld to fund a network project in February 1966, and Herzfeld transferred a million dollars from a ballistic missile defense program to Taylor's budget. Taylor hired Larry Roberts as a program manager in the ARPA Information Processing Techniques Office in January 1967 to work on the ARPANET. In April 1967, Roberts held a design session on technical standards. The initial standards for identification and authentication of users, transmission of characters, and error checking and retransmission procedures were discussed. At the meeting, Wesley Clark proposed minicomputers called Interface Message Processors (IMPs) should be used to interface to the network rather than the large mainframes that would be the nodes of the ARPANET. Roberts modified the ARPANET plan to incorporate Clark's suggestion. The plan was presented at the ACM Symposium in Gatlinburg, Tennessee, in October 1967. Donald Davies' work on packet switching and the NPL network, presented by a colleague (Roger Scantlebury), came to the attention of ARPANET developers at this conference. Roberts applied Davies' concept of packet switching for the ARPANET, and sought input from Paul Baran and Leonard Kleinrock. Building on his earlier work on queueing theory, Kleinrock modelled the performance of packet-switched networks, which underpinned the development of the ARPANET. The NPL network was using line speeds of 768 kbit/s, and the proposed line speed for the ARPANET was upgraded from 2.4 kbit/s to 50 kbit/s. By mid-1968, Roberts had prepared a complete plan for the computer network and gave a report to Taylor on June 3, who approved it on June 21. After approval by ARPA, a Request for Quotation (RFQ) was issued for 140 potential bidders. Most computer science companies regarded the ARPA proposal as outlandish, and only twelve submitted bids to build a network; of the twelve, ARPA regarded only four as top-rank contractors. At year's end, ARPA considered only two contractors, and awarded the contract to build the network to BBN Technologies on 7 April 1969. The initial, seven-person BBN team were much aided by the technical specificity of their response to the ARPA RFQ, and thus quickly produced the first working system. This team was led by Frank Heart and included Robert Kahn. The BBN-proposed network closely followed Roberts' ARPA plan: a network composed of small computers called Interface Message Processors (or IMPs), similar to the later concept of routers, that functioned as gateways interconnecting local resources. At each site, the IMPs performed store-and-forward packet switching functions, and were interconnected with leased lines via telecommunication data sets (modems), with initial data rates of 56kbit/s. The host computers were connected to the IMPs via custom serial communication interfaces. The system, including the hardware and the packet switching software, was designed and installed in nine months. The BBN team continued to interact with the NPL team. The first-generation IMPs were built by BBN Technologies using a rugged computer version of the Honeywell DDP-516 computer configured with 24KB of expandable magnetic-core memory, and a 16-channel Direct Multiplex Control (DMC) direct memory access unit. The DMC established custom interfaces with each of the host computers and modems. In addition to the front-panel lamps, the DDP-516 computer also features a special set of 24 indicator lamps showing the status of the IMP communication channels. Each IMP could support up to four local hosts, and could communicate with up to six remote IMPs via leased lines. The network connected one computer in Utah with three in California. Later, the Department of Defense allowed the universities to join the network for sharing hardware and software resources. It was from the RAND study that the false rumor started, claiming that the ARPANET was somehow related to building a network resistant to nuclear war. This was never true of the ARPANET, but was an aspect of the earlier RAND study of secure communication. The later work on internetworking did emphasize robustness and survivability, including the capability to withstand losses of large portions of the underlying networks. The RAND study was conducted by Paul Baran and was the first to build a theoretical model for communication using packet switching. In an interview he confirmed that while the ARPANET did not exactly share his project's goal, his work had greatly contributed to the development of the ARPANET. Minutes taken by Elmer Shapiro of Stanford Research Institute at the ARPANET design meeting of 9–10 October 1967 indicate that a version of Baran's routing method and suggestion of using a fixed packet size was expected to be employed. The goal was to exploit new computer technologies to meet the needs of military command and control against nuclear threats, achieve survivable control of US nuclear forces, and improve military tactical and management decision making. The ARPANET was not started to create a Command and Control System that would survive a nuclear attack, as many now claim. To build such a system was, clearly, a major military need, but it was not ARPA's mission to do this; in fact, we would have been severely criticized had we tried. Rather, the ARPANET came out of our frustration that there were only a limited number of large, powerful research computers in the country, and that many research investigators, who should have access to them, were geographically separated from them. The ARPANET was operated by the military during the two decades of its existence, until 1990. The University of Utah School of Computing, where Ivan Sutherland had moved, running a DEC PDP-10 operating on TENEX. The first successful message on the ARPANET was sent by UCLA student programmer Charley Kline, at 10:30 pm PST on 29 October 1969 (6:30 UTC on 30 October 1969), from Boelter Hall 3420. Kline transmitted from the university's SDS Sigma 7 Host computer to the Stanford Research Institute's SDS 940 Host computer. The message text was the word login; on an earlier attempt the l and the o letters were transmitted, but the system then crashed. Hence, the literal first message over the ARPANET was lo. About an hour later, after the programmers repaired the code that caused the crash, the SDS Sigma 7 computer effected a full login. The first permanent ARPANET link was established on 21 November 1969, between the IMP at UCLA and the IMP at the Stanford Research Institute. By 5 December 1969, the entire four-node network was established. In March 1970, the ARPANET reached the East Coast of the United States, when an IMP at BBN in Cambridge, Massachusetts was connected to the network. Thereafter, the ARPANET grew: 9 IMPs by June 1970 and 13 IMPs by December 1970, then 18 by September 1971 (when the network included 23 university and government hosts); 29 IMPs by August 1972, and 40 by September 1973. By June 1974, there were 46 IMPs, and in July 1975, the network numbered 57 IMPs. By 1981, the number was 213 host computers, with another host connecting approximately every twenty days. In 1973 a transatlantic satellite link connected the Norwegian Seismic Array (NORSAR) to the ARPANET, making Norway the first country outside the US to be connected to the network. At about the same time a terrestrial circuit added a London IMP. In 1975, the ARPANET was declared "operational". The Defense Communications Agency took control since ARPA was intended to fund advanced research. In September 1984 work was completed on restructuring the ARPANET giving U.S. military sites their own Military Network (MILNET) for unclassified defense department communications. Controlled gateways connected the two networks. The combination was called the Defense Data Network (DDN). Separating the civil and military networks reduced the 113-node ARPANET by 68 nodes. The MILNET later became the NIPRNet. It is considered illegal to use the ARPANet for anything which is not in direct support of Government business ... personal messages to other ARPANet subscribers (for example, to arrange a get-together or check and say a friendly hello) are generally not considered harmful ... Sending electronic mail over the ARPANet for commercial profit or political purposes is both anti-social and illegal. By sending such messages, you can offend many people, and it is possible to get MIT in serious trouble with the Government agencies which manage the ARPANet. Support for inter-IMP circuits of up to 230.4 kbit/s was added in 1970, although considerations of cost and IMP processing power meant this capability was not actively used. 1971 saw the start of the use of the non-ruggedized (and therefore significantly lighter) Honeywell 316 as an IMP. It could also be configured as a Terminal Interface Processor (TIP), which provided terminal server support for up to 63 ASCII serial terminals through a multi-line controller in place of one of the hosts. The 316 featured a greater degree of integration than the 516, which made it less expensive and easier to maintain. The 316 was configured with 40 kB of core memory for a TIP. The size of core memory was later increased, to 32 kB for the IMPs, and 56 kB for TIPs, in 1973. In 1975, BBN introduced IMP software running on the Pluribus multi-processor. These appeared in a few sites. In 1981, BBN introduced IMP software running on its own C/30 processor product. In 1983, TCP/IP protocols replaced NCP as the ARPANET's principal protocol, and the ARPANET then became one subnet of the early Internet. The original IMPs and TIPs were phased out as the ARPANET was shut down after the introduction of the NSFNet, but some IMPs remained in service as late as July 1990. ... it is somewhat fitting to end on the note that the ARPANET program has had a strong and direct feedback into the support and strength of computer science, from which the network, itself, sprang. Senator Albert Gore, Jr. authored the High Performance Computing and Communication Act of 1991, commonly referred to as "The Gore Bill", after hearing the 1988 concept for a National Research Network submitted to Congress by a group chaired by Leonard Kleinrock. The bill was passed on 9 December 1991 and led to the National Information Infrastructure (NII) which Al Gore called the information superhighway. The ARPANET project was honored with two IEEE Milestones, both dedicated in 2009. The starting point for host-to-host communication on the ARPANET in 1969 was the 1822 protocol, which defined the transmission of messages to an IMP. The message format was designed to work unambiguously with a broad range of computer architectures. An 1822 message essentially consisted of a message type, a numeric host address, and a data field. To send a data message to another host, the transmitting host formatted a data message containing the destination host's address and the data message being sent, and then transmitted the message through the 1822 hardware interface. The IMP then delivered the message to its destination address, either by delivering it to a locally connected host, or by delivering it to another IMP. When the message was ultimately delivered to the destination host, the receiving IMP would transmit a Ready for Next Message (RFNM) acknowledgement to the sending, host IMP. Unlike modern Internet datagrams, the ARPANET was designed to reliably transmit 1822 messages, and to inform the host computer when it loses a message; the contemporary IP is unreliable, whereas the TCP is reliable. Nonetheless, the 1822 protocol proved inadequate for handling multiple connections among different applications residing in a host computer. This problem was addressed with the Network Control Program (NCP), which provided a standard method to establish reliable, flow-controlled, bidirectional communications links among different processes in different host computers. The NCP interface allowed application software to connect across the ARPANET by implementing higher-level communication protocols, an early example of the protocol layering concept incorporated to the OSI model. In 1983, TCP/IP protocols replaced NCP as the ARPANET's principal protocol, and the ARPANET then became one component of the early Internet. NCP provided a standard set of network services that could be shared by several applications running on a single host computer. This led to the evolution of application protocols that operated, more or less, independently of the underlying network service, and permitted independent advances in the underlying protocols. In 1971, Ray Tomlinson, of BBN sent the first network e-mail (RFC 524, RFC 561). By 1973, e-mail constituted 75 percent of the ARPANET traffic. By 1973, the File Transfer Protocol (FTP) specification had been defined (RFC 354) and implemented, enabling file transfers over the ARPANET. The Network Voice Protocol (NVP) specifications were defined in 1977 (RFC 741), then implemented, but, because of technical shortcomings, conference calls over the ARPANET never worked well; the contemporary Voice over Internet Protocol (packet voice) was decades away. The Purdy Polynomial hash algorithm was developed for the ARPANET to protect passwords in 1971 at the request of Larry Roberts, head of ARPA at that time. It computed a polynomial of degree 224 + 17 modulo the 64-bit prime p = 264 - 59. The algorithm was later used by Digital Equipment Corporation (DEC) to hash passwords in the VMS Operating System, and is still being used for this purpose. Computer Networks: The Heralds of Resource Sharing, a 30-minute documentary film featuring Fernando J. Corbato, J.C.R. Licklider, Lawrence G. Roberts, Robert Kahn, Frank Heart, William R. Sutherland, Richard W. Watson, John R. Pasta, Donald W. Davies, and economist, George W. Mitchell. "Scenario", a February 1985 episode of the U.S. television sitcom Benson (season 6, episode 20), was the first incidence of a popular TV show directly referencing the Internet or its progenitors. The show includes a scene in which the ARPANET is accessed. There is an electronic music artist known as "Arpanet", Gerald Donald, one of the members of Drexciya. The artist's 2002 album Wireless Internet features commentary on the expansion of the internet via wireless communication, with songs such as NTT DoCoMo, dedicated to the mobile communications giant based in Japan. Thomas Pynchon mentions the ARPANET in his 2009 novel Inherent Vice, which is set in Los Angeles in 1970, and in his 2013 novel Bleeding Edge. The 1993 television series The X-Files featured the ARPANET in a season 5 episode, titled "Unusual Suspects". John Fitzgerald Byers offers to help Susan Modeski (known as Holly . . . "just like the sugar") by hacking into the ARPANET to obtain sensitive information. In the spy-drama television series The Americans, a Russian scientist defector offers access to ARPANET to the Russians in a plea to not be repatriated (Season 2 Episode 5 "The Deal"). Episode 7 of Season 2 is named 'ARPANET' and features Russian infiltration to bug the network. In the television series Person of Interest, main character Harold Finch hacked the ARPANET in 1980 using a homemade computer during his first efforts to build a prototype of the Machine. This corresponds with the real life virus that occurred in October of that year that temporarily halted ARPANET functions. The ARPANET hack was first discussed in the episode 2PiR where a computer science teacher called it the most famous hack in history and one that was never solved. Finch later mentioned it to Person of Interest Caleb Phipps and his role was first indicated when he showed knowledge that it was done by "a kid with a homemade computer" which Phipps, who had researched the hack, had never heard before. In the third season of the television series Halt and Catch Fire, the character Joe MacMillan explores the potential commercialization of the ARPANET. Usenet, "A Poor Man's ARPAnet"
↑ G. Schneider; J. Evans; K. Pinard (2009). The Internet - Illustrated. Cengage Learning. ISBN 0538750987. Retrieved 2015-08-15. ↑ R. Oppliger (2001). Internet and Intranet Security. Artech House. p. 12. ISBN 1580531660. Retrieved 2015-08-15. ↑ H. Bidgoli, ed. (2004). The Internet Encyclopedia. 2: G–O. John Wiley & Sons. ISBN 0471689963. Retrieved 2015-08-15. ↑ "Lawrence Roberts Manages The ARPANET Program". Living Internet.com. Retrieved 6 November 2008. ↑ John Markoff (20 December 1999). "An Internet Pioneer Ponders the Next Revolution". The New York Times. Archived from the original on 22 September 2008. Retrieved 20 September 2008. 1 2 "Paul Baran and the Origins of the Internet". RAND corporation. Retrieved 29 March 2011. ↑ Scantlebury, Roger (25 June 2013). "Internet pioneers airbrushed from history". The Guardian. Retrieved 1 August 2015. ↑ "Packets of data were the key...". NPL. Retrieved 1 August 2015. ↑ Isaacson, Walter (2014). The Innovators: How a Group of Hackers, Geniuses, and Geeks Created the Digital Revolution. Simon & Schuster. p. 237. ISBN 9781476708690. ↑ "The accelerator of the modern age". BBC News. 5 August 2008. Retrieved 19 May 2009. 1 2 Cambell-Kelly, Martin (Autumn 2008). "Pioneer Profiles: Donald Davies". Computer Resurrection (44). ISSN 0958-7403. ↑ Roberts, Lawrence G. (November 1978). "The Evolution of Packet Switching". Retrieved 9 April 2016. ↑ "Donald Davies". thocp.net ; "Donald Davies". internethalloffame.org. ↑ M. Ziewitz & I. Brown (2013). Research Handbook on Governance of the Internet. Edward Elgar Publishing. p. 7. ISBN 1849805040. Retrieved 2015-08-16. ↑ "Brief History of the Internet". Internet Society. Retrieved April 9, 2016. ↑ "Lawrence Roberts Manages The ARPANET Program". Living Internet. 7 January 2000. Retrieved 5 September 2017. 1 2 "IMP -- Interface Message Processor". Living Internet. 7 January 2000. Retrieved 5 September 2017. ↑ "Lawrence Roberts". Encyclopædia Britannica. Retrieved 5 September 2017. 1 2 Roberts, Lawrence G. Dr (November 1978). "The Evolution of Packet Switching". Retrieved 5 September 2017. 1 2 Gillies, James; Cailliau, Robert (2000). How the Web was Born: The Story of the World Wide Web. Oxford University Press. p. 25. ISBN 0192862073. ↑ "Inductee Details - Donald Watts Davies". National Inventors Hall of Fame. Retrieved 6 September 2017. ↑ "Brief History of the Internet". Internet Society. Retrieved July 12, 2017. ↑ "Looking back at the ARPANET effort, 34 years later". February 2003. Retrieved 5 September 2017. ↑ Abbate, Jane (2000). Inventing the Internet. MIT Press. p. 38. ISBN 0262261332. ↑ Heart, Frank; Kahn, Robert; Ornstein, Severo; Crowther, William; Walden, David (1970). "The Interface Message Processor for the ARPA Computer Network" (PDF). AFIPS Proc. 36: 565. doi:10.1145/1476936.1477021. ↑ Wise, Adrian. "Honeywell DDP-516". Old-Computers.com. Retrieved 21 September 2008. ↑ Brand, Stewart (March 2001). "Founding Father". Wired (9.03). Retrieved 31 December 2011. ↑ "Shapiro: Computer Network Meeting of October 9-10, 1967". stanford.edu. ↑ Lukasik, Stephen J. (2011). "Why the Arpanet Was Built". IEEE Annals of the History of Computing. 33 (3): 4–20. doi:10.1109/MAHC.2010.11. ↑ "Charles Herzfeld on the ARPANET and Computers". About.com. Retrieved 21 December 2008. ↑ Jessica Savio (1 April 2011). "Browsing history: A heritage site has been set up in Boelter Hall 3420, the room the first Internet message originated in". Daily Bruin. UCLA. ↑ Chris Sutton (2 September 2004). "Internet Began 35 Years Ago at UCLA with First Message Ever Sent Between Two Computers". UCLA. Archived from the original on 8 March 2008. ↑ "NORSAR becomes the first non-US node on ARPANET, the predecessor to today's Internet". NORSAR (Norway Seismic Array Research). Archived from the original on 11 September 2017. Retrieved 14 November 2017. ↑ ARPANET INFORMATION BROCHURE (NIC 50003) Defense Communications Agency, December 1985. ↑ Fritz E. Froehlich; Allen Kent (1990). "ARPANET, the Defense Data Network, and Internet". The Froehlich/Kent Encyclopedia of Telecommunications. 1. CRC Press. pp. 341–375. ISBN 978-0-8247-2900-4. ↑ Stacy, Christopher C. (1982-09-07). "Getting Started Computing at the AI Lab". ↑ Kirstein, Peter T. (July–September 2009). "The Early Days of the Arpanet". IEEE Annals of the History of Computing. 31 (3): 67. doi:10.1109/mahc.2009.35. ISSN 1058-6180. ↑ Abbate, Janet (11 June 1999). Inventing the Internet. Cambridge, MA: MIT Press. ASIN B003VPWY6E. ISBN 0-262-01172-7. ↑ "Milestones:Birthplace of the Internet, 1969". IEEE Global History Network. IEEE. Retrieved 4 August 2011. ↑ "Milestones:Inception of the ARPANET, 1969". IEEE Global History Network. IEEE. Retrieved 4 August 2011. ↑ Tomlinson, Ray. "The First Network Email". BBN. Archived from the original on 6 May 2006. Retrieved 6 March 2012. ↑ Steven King (Producer), Peter Chvany (Director/Editor) (1972). Computer Networks: The Heralds of Resource Sharing. Archived from the original on 15 April 2013. Retrieved 20 December 2011. ↑ The X-Files Season 5, Ep. 3 "Unusual Suspects". ↑ Season 2, Episode 11 "2πR"
↑ Season 3, Episode 12 "Aletheia"
↑ "BBC News - SCI/TECH - Hacking: A history". bbc.co.uk. ↑ "Hobbes' Internet Timeline - the definitive ARPAnet & Internet history". zakon.org. Norberg, Arthur L.; O'Neill, Judy E. (1996). Transforming Computer Technology: Information Processing for the Pentagon, 1962–1982. Johns Hopkins University. pp. 153–196. ISBN 978-0-8018-6369-1. A History of the ARPANET: The First Decade (Report). Arlington, VA: Bolt, Beranek & Newman Inc. 1 April 1981. Abbate, Janet (11 June 1999). Inventing the Internet. Cambridge, MA: MIT Press. pp. 36–111. ASIN B003VPWY6E. ISBN 0-262-01172-7. Salus, Peter H. (1 May 1995). Casting the Net: from ARPANET to Internet and Beyond. Addison-Wesley. ISBN 978-0-201-87674-1. Waldrop, M. Mitchell (23 August 2001). The Dream Machine: J. C. R. Licklider and the Revolution That Made Computing Personal. New York: Viking. ASIN B00008MNVW. ISBN 0-670-89976-3. "The Computer History Museum, SRI International, and BBN Celebrate the 40th Anniversary of First ARPANET Transmission". Computer History Museum. 27 October 2009. "Oral history interview with Robert E. Kahn". University of Minnesota, Minneapolis: Charles Babbage Institute. 24 April 1990. Retrieved 15 May 2008. Focuses on Kahn's role in the development of computer networking from 1967 through the early 1980s. Beginning with his work at Bolt Beranek and Newman (BBN), Kahn discusses his involvement as the ARPANET proposal was being written and then implemented, and his role in the public demonstration of the ARPANET. The interview continues into Kahn's involvement with networking when he moves to IPTO in 1972, where he was responsible for the administrative and technical evolution of the ARPANET, including programs in packet radio, the development of a new network protocol (TCP/IP), and the switch to TCP/IP to connect multiple networks. "Oral history interview with Vinton Cerf". University of Minnesota, Minneapolis: Charles Babbage Institute. 24 April 1990. Retrieved 1 July 2008. Cerf describes his involvement with the ARPA network, and his relationships with Bolt Beranek and Newman, Robert Kahn, Lawrence Roberts, and the Network Working Group. "Oral history interview with Paul Baran". University of Minnesota, Minneapolis: Charles Babbage Institute. 5 March 1990. Retrieved 1 July 2008. Baran describes his work at RAND, and discusses his interaction with the group at ARPA who were responsible for the later development of the ARPANET. "Oral history interview with Leonard Kleinrock". University of Minnesota, Minneapolis: Charles Babbage Institute. 3 April 1990. Retrieved 1 July 2008. Kleinrock discusses his work on the ARPANET. "Oral history interview with Larry Roberts". University of Minnesota, Minneapolis: Charles Babbage Institute. 4 April 1989. Retrieved 1 July 2008. "Oral history interview with Stephen Lukasik". University of Minnesota, Minneapolis: Charles Babbage Institute. 17 October 1991. Retrieved 1 July 2008. Lukasik discusses his tenure at the Advanced Research Projects Agency (ARPA), the development of computer networks and the ARPANET. Roberts, Larry; Marrill, Tom (October 1966). Toward a Cooperative Network of Time-Shared Computers. Fall AFIPS Conference. Roberts, Larry (October 1967). Multiple computer networks and intercomputer communication. ACM Symposium on Operating System Principles. Davies, D. W.; Bartlett, K. A.; Scantlebury, R. A.; Wilkinson, P. T. (October 1967). A digital communications network for computers giving rapid response at remote terminals. ACM Symposium on Operating Systems Principles. Roberts, Larry; Wessler, Barry (May 1970). Computer Network Development to Achieve Resource Sharing. Proceedings of the Spring Joint Computer Conference, Atlantic City, New Jersey. Heart, Frank; Kahn, Robert; Ornstein, Severo; Crowther, William; Walden, David (1970). The Interface Message Processor for the ARPA Computer Network (PDF). 1970 Spring Joint Computer Conference. AFIPS Proc. 36. pp. 551–567. doi:10.1145/1476936.1477021. Carr, Stephen; Crocker, Stephen; Cerf, Vinton (1970). Host-Host Communication Protocol in the ARPA Network. 1970 Spring Joint Computer Conference. AFIPS Proc. 36. pp. 589–598. doi:10.1145/1476936.1477024. RFC 33 . Ornstein, Severo; Heart, Frank; Crowther, William; Russell, S. B.; Rising, H. K.; Michel, A. (1972). The Terminal IMP for the ARPA Computer Network. 1972 Spring Joint Computer Conference. AFIPS Proc. 40. pp. 243–254. McQuillan, John; Crowther, William; Cosell, Bernard; Walden, David; Heart, Frank (1972). Improvements in the Design and Performance of the ARPA Network. 1972 Fall Joint Computer Conference part II. AFIPS Proc. 41. pp. 741–754. Roberts, Larry (November 1978). "The Evolution of Packet Switching". Proceedings of the IEEE. 66 (11): 1307–1313. doi:10.1109/PROC.1978.11141. Roberts, Larry (September 1986). "The ARPANET & Computer Networks". ACM. Wikimedia Commons has media related to ARPANET. "ARPANET Maps 1969 to 1977". California State University, Dominguez Hills (CSUDH). 4 January 1978. Archived from the original on 19 April 2012. Retrieved 17 May 2012. Walden, David C. (February 2003). "Looking back at the ARPANET effort, 34 years later". Living Internet. East Sandwich, Massachusetts: livinginternet.com. Retrieved 17 August 2005. "Images of ARPANET from 1964 onwards". The Computer History Museum. Retrieved 29 August 2004. Timeline. "Paul Baran and the Origins of the Internet". RAND Corporation. Retrieved 3 September 2005. "Doug Engelbart's Role in ARPANET History". 2008. Retrieved 3 September 2009. "Internet Milestones: Timeline of Notable Internet Pioneers and Contributions". Retrieved 6 January 2012. Timeline. Waldrop, Mitch (April 2008). "DARPA and the Internet Revolution". 50 years of Bridging the Gap. DARPA. pp. 78–85. Archived from the original on 15 September 2012. Retrieved 26 August 2012. 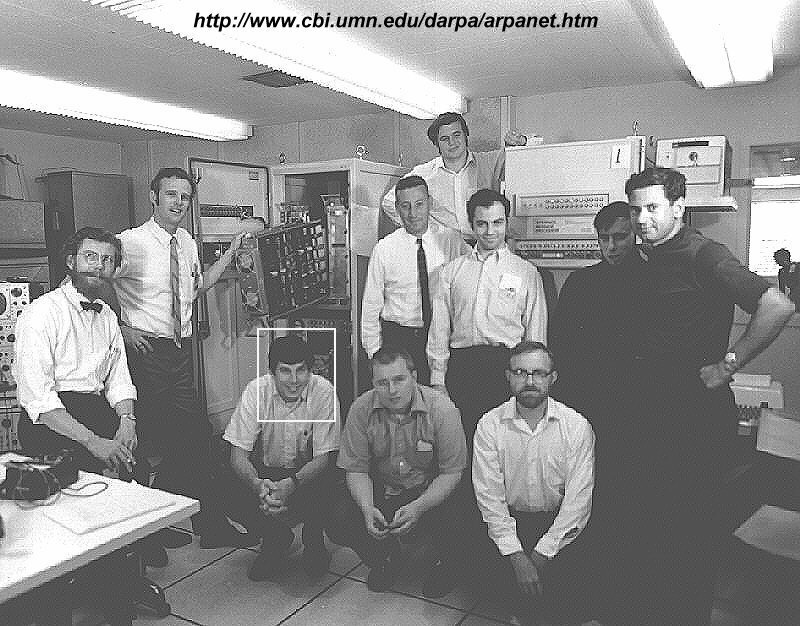 "A picture of the ARPANET team". Archived from the original on 22 December 2014. "Robert X Cringely: A Brief History of the Internet".